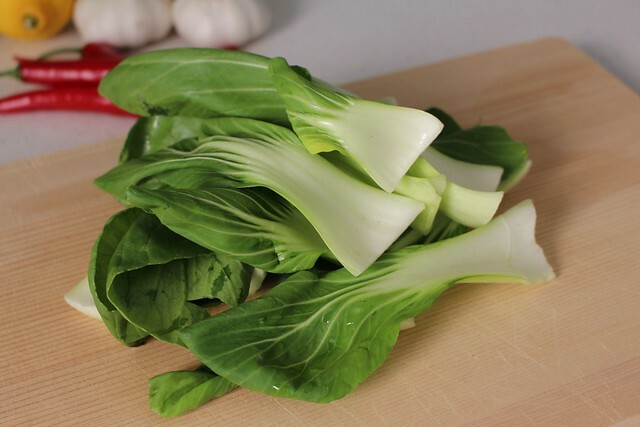 We had it easy with our firstborn - he was eating handfuls of lightly braised Shanghai bok choy before he turned 2. So it furrowed our brows some to discover that vegetables were not our second son's thing. We started blending our green food powder in with his smoothies from the time he could sip from a straw, but we were still eager to see him eating substantial portions of freshly cooked green vegetables. Through trial and error and several failed attempts that involved bribery and maybe a few threats of punishment, we were able to alleviate stress for all by adhering to a routine of finely chopping cooked greens and mixing them in with foods that he is eager to gobble down. As I've written about on many occasions, while it's fine to eat raw greens, I'm a big believer in regularly eating cooked greens, as cooking breaks down plant cell walls, which allows for more thorough extraction of nutrients from our vegetables. Pre-heat two to three tablespoons of extra-virgin olive oil in a large pan. 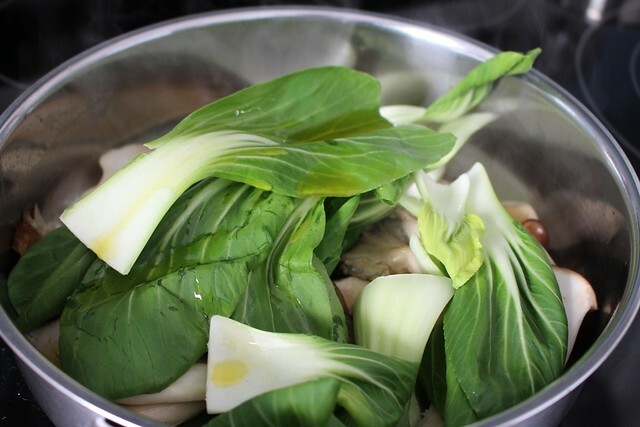 Wash and dry two large handfuls of Shanghai bok choy. 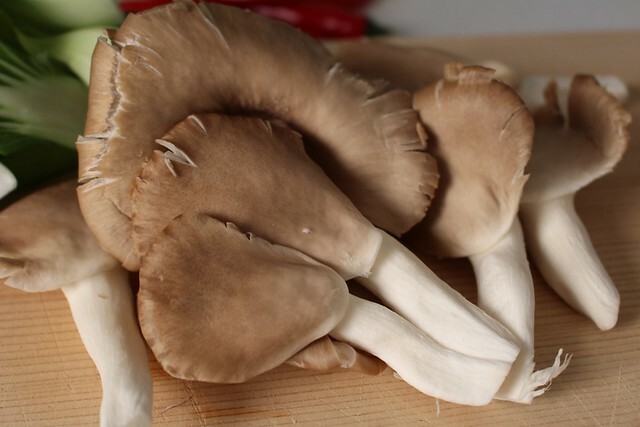 Use a paper towel to brush off any dirt that might be on oyster mushrooms. 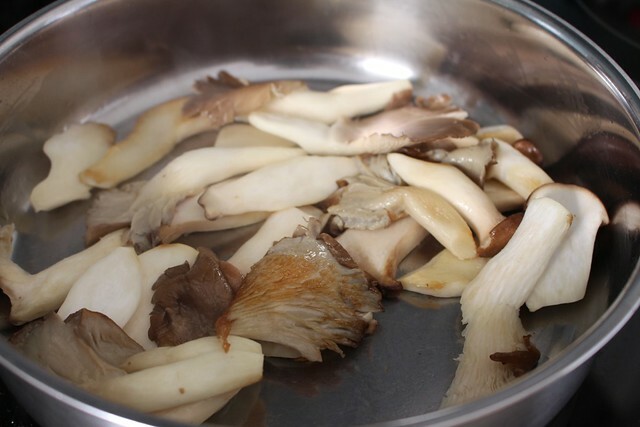 If you have any larger pieces, give them a quick chop to encourage even cooking of all of your mushrooms. 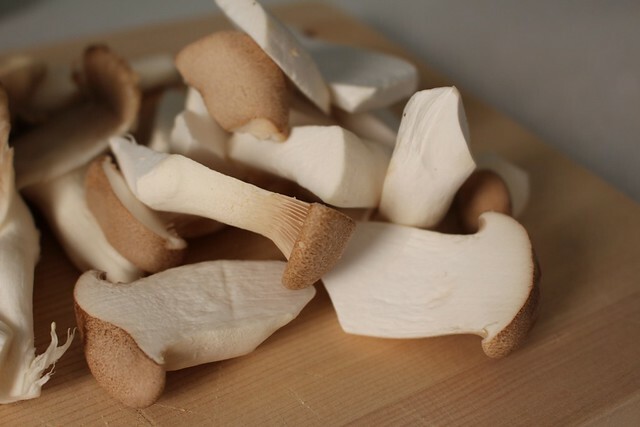 We love oyster mushrooms for their meaty texture and depth of flavor when properly sauteed. Same thing with your king oyster mushrooms. 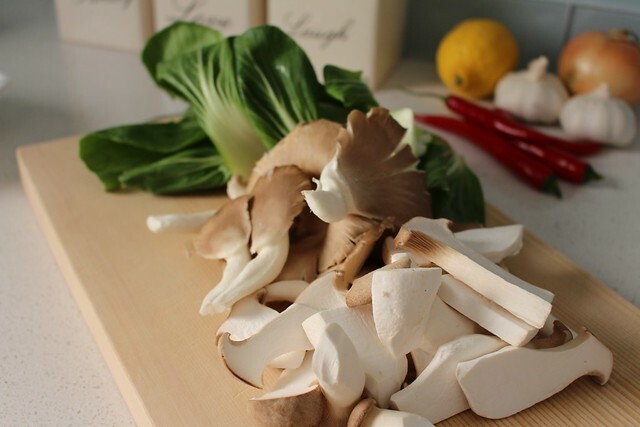 So your oyster mushrooms, king oysters, and Shanghai bok choy should all be ready to go. Start with your mushrooms. You want them to sizzle a bit in the pan for a little caramelization, which adds lovely flavor and texture - you won't get this if your pan is not pre-heated, so be sure to pre-heat! 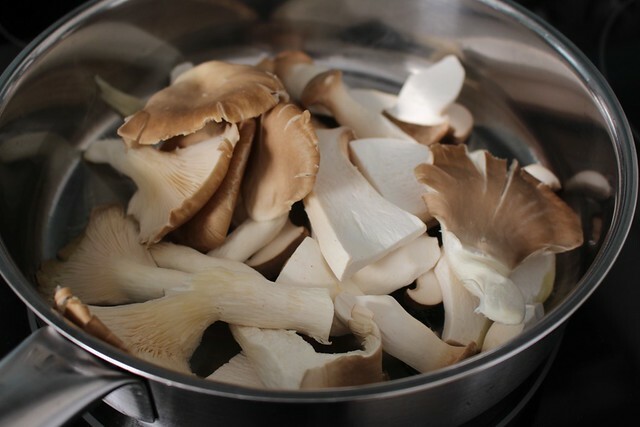 Also be mindful of tossing the mushrooms a few times while they cook, as oyster mushrooms are prone to sticking, especially when cooked in a stainless steel pan. 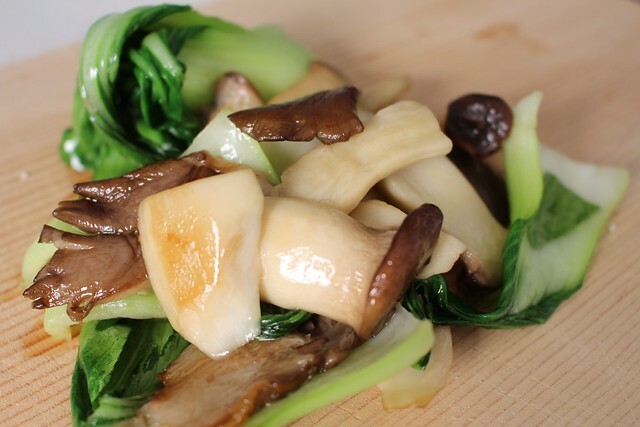 When your mushrooms have a golden tinge to them, add your Shanghai bok choy along with another tablespoon or two of extra virgin olive oil. Then continue to toss as your greens cook down. Season with sea salt, to taste. 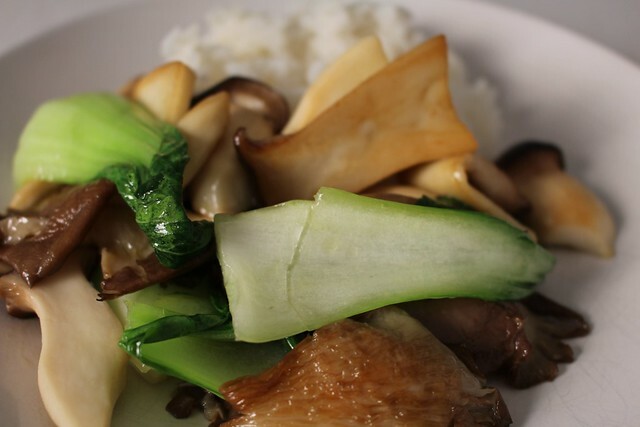 If you're entirely plant-based, serve your cooked greens and mushrooms up with some steamed rice or quinoa. I don't eat too many animal products these days other than some organic eggs and wild fish on occasion, so most of my cooked meals look something like this. For our boys, we have long included a portion of fish, chicken, beef or egg with most of their meals. Over the years, my experiences working with families who have raised their children as strict vegans have led me to feel that including some clean animal foods in a growing child's diet is helpful for overall development, but this a highly personal decision and a topic for a different post. Turn heat down to just a shade below medium, add another tablespoon or two of extra-virgin olive oil, then cook chicken, carrots, and celery. Our boys like their chicken best when it has been marinated overnight in a bit of soy sauce. 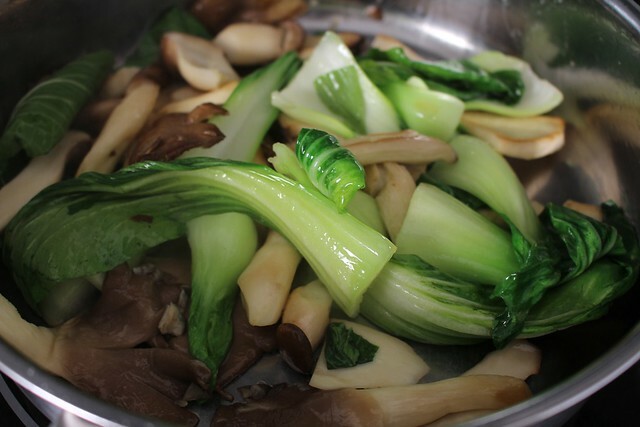 We often add just a splash of sesame oil as it cooks. 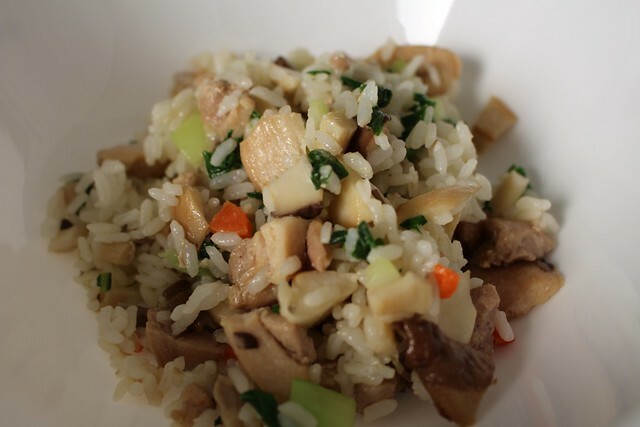 While chicken, carrots, and celery are cooking, chop cooked mushrooms and greens and add them to servings of steamed rice. 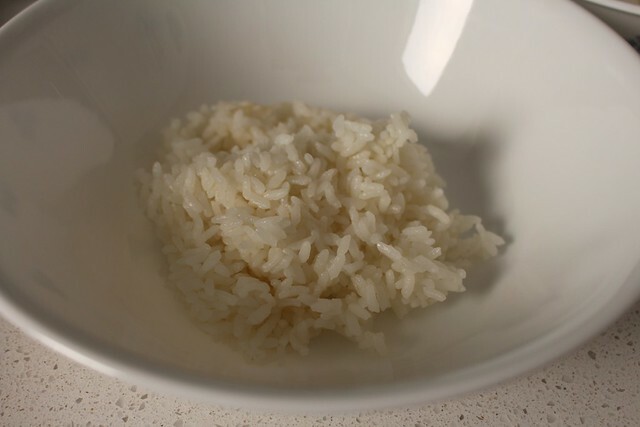 Any type of rice will do. 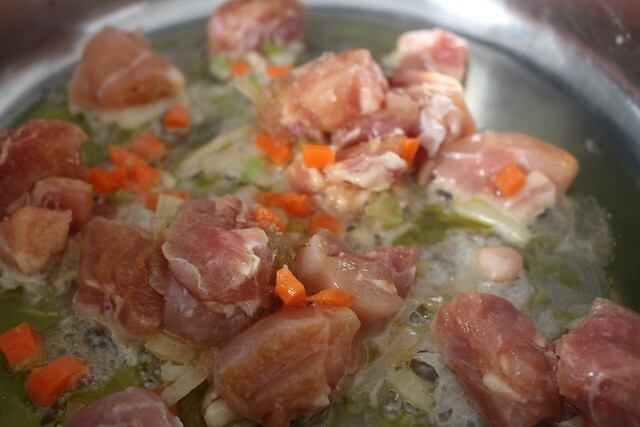 Finish braising chicken with chopped carrots and celery. You can always add a little broth to help finish braising if natural juices from the chicken, carrots, celery, and marinade run out. 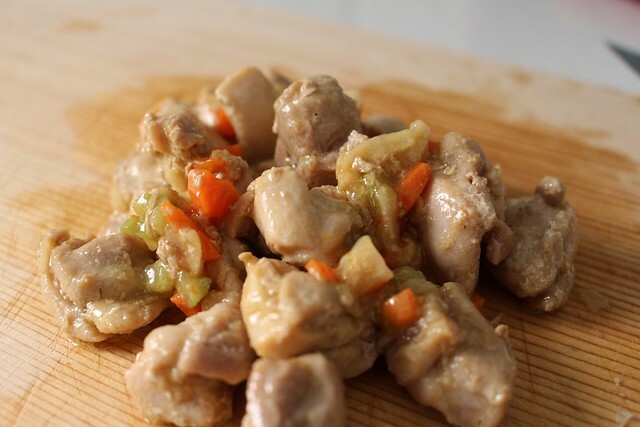 For toddlers, feel free to chop cooked chicken and vegetables into manageable pieces before adding to the rice and vegetables. Add cooked chicken, carrots, and celery. Give everything a good mix and be sure that dark green vegetables are evenly distributed if you have anyone in the house who has a problem with too much green in one location. And there you have it, a simple meal with plenty of vegetables that most kids will enjoy. For variety, you can add vegetable or chicken broth just before serving to turn a dish like this into a hearty soup or stew. 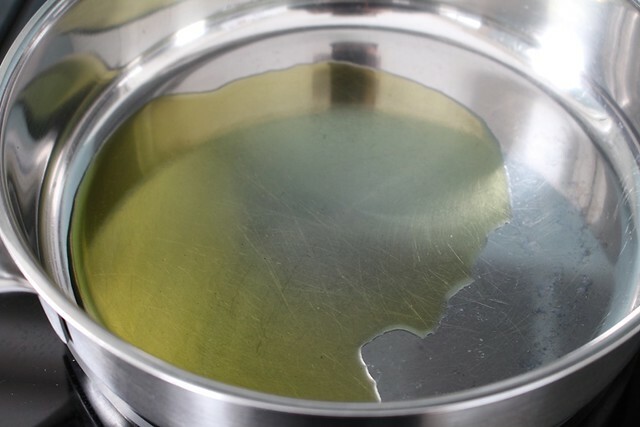 However, children can't garner any mineral content from plant foods, especially greens (which are technically diuretics) until after age 6 or so. This idea that kids should ignore healthy fats and switch to high carb and sugar fruit diets of solid foods lends itself more towards building dis-ease than away from it. Eat all the plants you want, but most of it just ferments and spoils inside of your body. Humans are especially unequipped to handle plant foods these days, raw or cooked, due to the high amounts of antibiotics that are used today which kill our microflora. Thank you Dr. Ben looks amazing. Like your friend I like to see the finished product at the beginning, makes me we want to give it a try and see if it tastes as good as it looks. 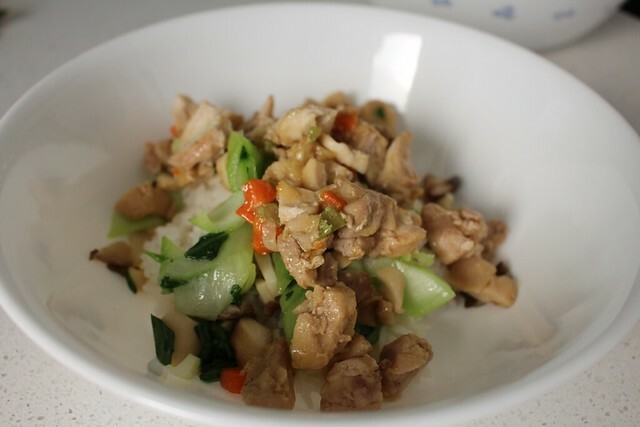 I would adapt your recipe to my families needs using cauliflower rice and coconut oil, I hope it comes up looking and tasting as nice as yours. this recipe looks great. good pictures too. i guess i like seeing the picture, then the written word but actually either way is fine by me. what about side-by-side? might please both groups. 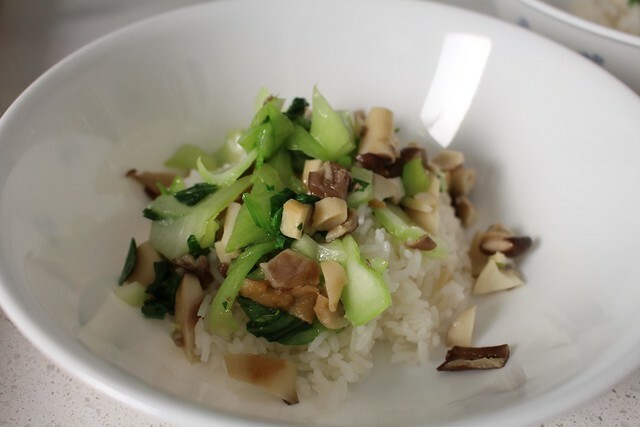 Thank you Dr. Kim for photo essay on cooking more greens....yummy! You asked about words before photos or after. I like what you've done here, but for me, reading the description of what I will next see in a recipe is like getting a roadmap. I like the words first. Either way, I appreciate your essay on greens! For years I have looked at many sites for recipes. Each one having their own pictures. I was amazed at the clarity of your photos. You certainly have a good eye. Keep up the great work. Food Pics followed by Instructions.--Remember a Pic is worth a Thousand words. The dialogue under the Picture is Confirming and Explaining the Image. The main thing though is Consistantly use one system. Thanks you for the Wonderful tips and encouragement. I love all your recipes and I am thankful for the pictures also. I don't care how you put the recipes on the page. The food you make is wonderful and healthy . Thanks for sharing. I love the Korean food.